Some of the UK’s most beautiful waterways are in the preserve of the National Trust and as long as you play by their rules, they make wonderful locations for sailing and boating. Within the 623,000 acres now owned or looked after by the National Trust – including a quarter of the Lake District and around 12% of the Peak District National Park – there are innumerable rivers, lakes and coastal waters, and with them, ample opportunities for sailing and boating larks. However in its duty to maintain pleasant and tranquil natural environments and preserve wildlife habitats, the Trust has to impose limits on the use of boats on its conservation waters. Therefore before embarking on an afternoon of sailing or boating, it is important to first to check whether any rules and regulations apply – such as having to first obtain permission, a licence or insurance – by first contacting the office or organisation responsible for the area. As they are environmentally friendly pursuits, and relatively peaceful and harmonious with the natural surroundings, the National Trust largely welcomes the use of canoes, rowing boats and sailboats on its coastal and inland waterways. And as long as it is not contravening any local restrictions, such vessels can be launched and landed on any part of the shore open to the public. In being noisier, more disruptive and environmentally damaging, the use of motorboats is more limited. They are restricted to specified areas and speed limitations and, sometimes, to specific times. This activity is permitted on a relatively small number of the Trust’s navigable inland waterways, and most of its coastal waters – where the organisation maintains a number of moorings and slipways. Motorboat use is heavily restricted because their impact on their surroundings, in terms of emissions, noise, erosion and water quality, can be major, particularly if use is concentrated. They also present a danger to other water users. More environmentally friendly motor craft, such as vessels powered by electricity, are more sympathetic to the interests of the Trust and will likely receive greater leniency. For more information about boating on National Trust waters in your area, it is advisable to contact the appropriate regional office. 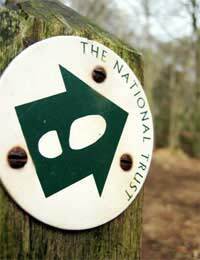 The National Trust has now been working to preserve and protect the countryside, coastlines and buildings of England, Wales and Northern Ireland since 1895. It is not a government funded organisation but instead a charity that relies on the support of its 3.5 million members – who make it one of the largest membership organisations in the world. There are waterways in National Trust preservation areas that don’t just tolerate boating but actively encourage it because they provide ideal conditions for boating activities. Northumberland’s Farne Islands is one such location. The windy coastal waters provide great condition for sailing, whilst the sheltered spots around the rocky islands provide good locations for dropping anchor. The journey from mainland Bamburgh to the islands and back is also popular with canoeists and kayakers. In the opposite corner of England, the Salcombe and Kingsbridge estuary is legendary for its sailing waters. It also provides good conditions for canoeing and kayaking. The Lake District’s Coniston Water is also a great spot for exploring by boat. For more challenging conditions then Wales’s St David’s peninsula provides a brilliant location for experienced sea kayakers.